Introduced by State Senator Lindsey Tippins, R-Marietta, this bill would exempt public and state charter schools from paying for Plant Vogtle construction on their power bills. SB 393 is cosponsored by State Senator Chuck Hufstetler, R-Rome, who has also introduced legislation to limit collection of the Nuclear Construction Cost Recovery Tariff from all Georgians and limit Georgia Power’s ability to profit from cost overruns and delays at Plant Vogtle. Georgia Watch strongly supports SB 393 to exempt public schools from paying Vogtle construction costs on their power bills. State Representative Paulette Rakestraw, R-Hiram, is proactively working to ease the financial stress on the men and women of our armed forces by introducing House Bill 676. This legislation would allow a court to suspend the sale, foreclosure, or seizure of property belonging to service members on active duty deployment during the duration of their deployment plus 30 days thereafter. Georgia Watch supports HB 676 as it will grant the brave men and women in our military the peace of mind that their homes and property will be there when they get home. This bill introduced by State Senator David Shafer, R-Duluth, would make credit freezes (and thaws) from all three credit reporting agencies free for all Georgians all the time. This is a very significant benefit for Georgia consumers! 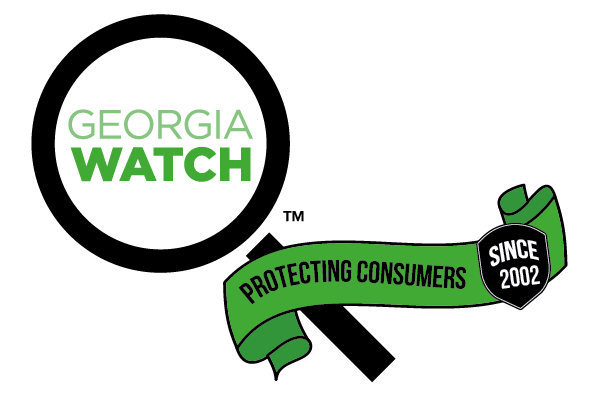 Georgia Watch supports legislation that removes fees for credit freezes and better enables Georgia consumers to safeguard their financial information. Georgia Watch continues to support legislation to end surprise medical bills, including Senate Bill 359, and Senate Bill 355 to limit Georgia Power's ability to profit from cost overruns and delays at Plant Vogtle. Read more about our current legislative agenda here . Members of the coalition will be invited to the Georgia Financial Protection and Economic Opportunity Summit on March 8, 2018 in Atlanta, GA hosted by Georgia Watch and Georgia Budget and Policy Institute in partnership with Prosperity Now, and Center for Responsible Lending, and with support from JPMorgan Chase and others. To request to join the Georgia Financial Protection Coalition and receive an invitation to the Summit , click here . During winter, families in Georgia often face the prospect of high energy bills to warm their homes. Some families, particularly low-income families living in energy inefficient homes, may find themselves forced to choose between paying for adequate heating or cooling and buying groceries. 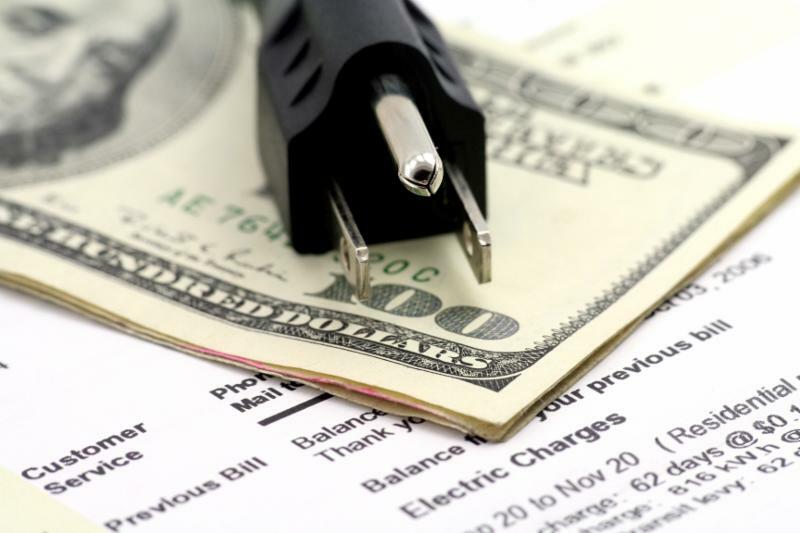 These high energy bills increase financial instability for low-income families, who sometimes turn to high risk loans to pay their energy bills, while others may put their own health at risk by cutting back on necessary heating. Georgia Watch offers free educational resources and workshops to help struggling families take better control over their energy bills. Our resources and workshops offer tips about how to save money on energy bills. During our “How to Save Money on Your Utility Bills” workshops, for example, participants learn about practical energy efficiency measures they can take to reduce their energy bills: weatherizing windows, insulating pipes, upgrading light bulbs, caulking up cracks, etc. Additionally, participants also learn about current programs available to help them reduce and better manage their energy use to lower their bills. If your organization is interested in hosting a workshop for your community, please reach out to Trey Cason ( tcason@georgiawatch.org) to set up a workshop. Mark your calendars! 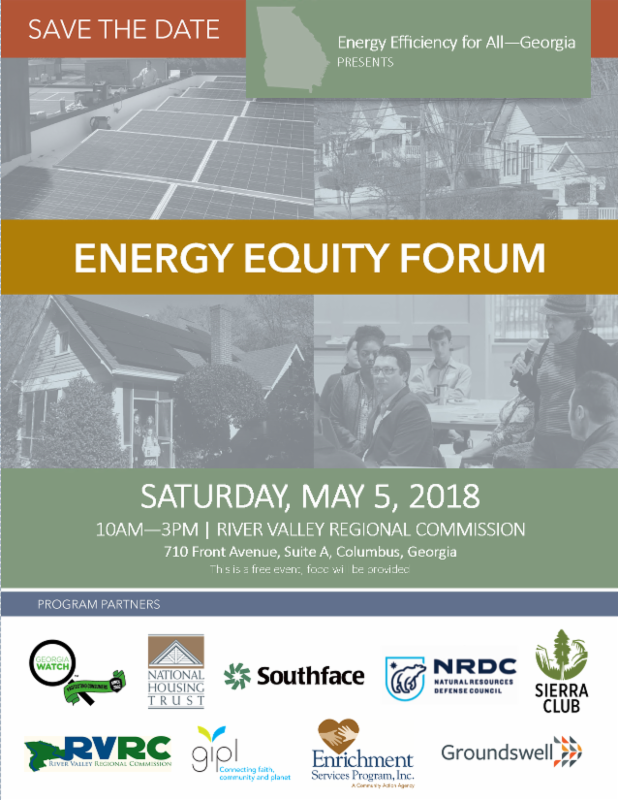 Georgia Watch and Energy Efficiency for All partners are hosting an Energy Equity Forum in Columbus, Georgia on May 5th at the River Valley Regional Commission. The free forum will bring together community members, utility and community leaders, advocates and policymakers to discuss how to reduce energy bills and make solar and energy efficiency more accessible to communities in and around Columbus. 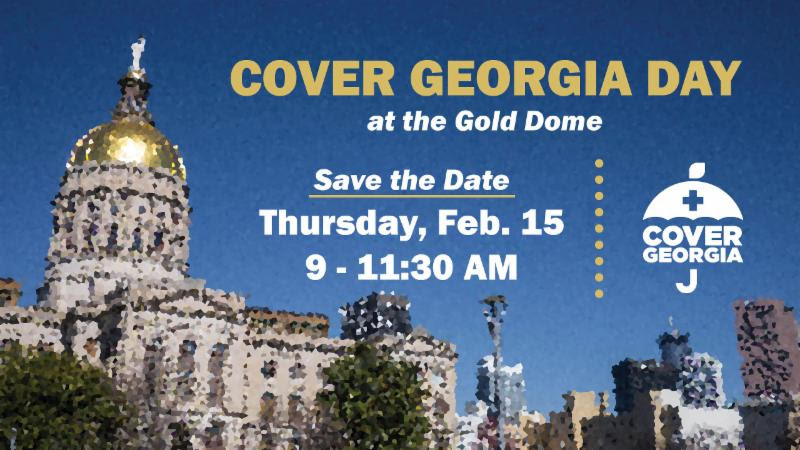 Next week, join the Cover Georgia Coalition for Cover Georgia Day at the Gold Dome. Participants will receive advocacy training, connect with state legislators and assist in making the case for closing Georgia's coverage gap. Cover Georgia is a broad coalition of community stakeholders and advocates focused on ensuring that all Georgians regardless of income get the health coverage and care they need. We are excited to announce the release of our 2018-2020 Strategic Plan! The plan outlines our vision, goals, and priorities going forward. 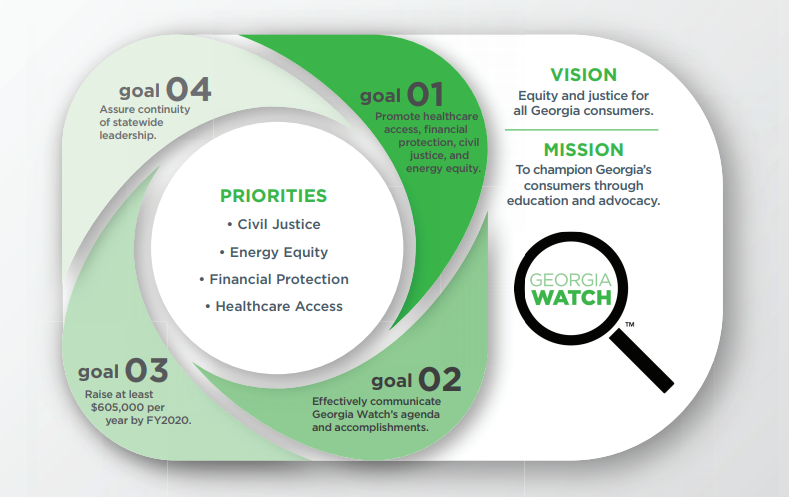 We invite you to read through the plan and continue to support our efforts to protect Georgia consumers in all areas that impact quality of life. We welcome your feedback!